Who is Open to know Jesus? The Cities Need the Gospel! Giving the Right Gift This Time of the Year! Do you ever catch yourself asking the question, “Are we really intentional in our outreach/evangelism efforts?” I have been asked that same question in the many meetings with pastors, staff and churches across our nation. The fact that you are asking the question(s) reveals you are on the right path to becoming more intentional in your evangelistic efforts. I decided to create a list of benchmarks so you can know if your church is doing intentional evangelism. (Note that this is not a comprehensive list). I think these six benchmarks or metrics give insight whether your ministry is intentional and helps your church to reach a level of intentional evangelism. Your overall evangelism strategy includes a component for intentional follow up with all visitors who come to your church, regardless of the venue. Follow up is a great opportunity for your church to share the gospel. Your follow up should occur within an appropriate time frame following the event or their visit. For more information on training your church in evangelism, prayer, and follow up, go to m28evangelism.com to learn about the various trainings offered. Do Church Plants Really Produce More Baptisms? According to God’s Word, church plants are the result of intentional evangelistic strategy and work, see Acts 13, 14, 15. Church Planting is not our mandate. Jesus told His disciples to go make disciples which in the context of His day, preach God’s Word, call for decisions, call out disciples to follow Jesus, train the disciples and then send them out to do the same process. The Holy Spirit drove the apostle Paul into the mega cities of his day to proclaim the message that the God of Creation had come in the form of a man in Jesus Christ, was crucified for our sins, and rose from the dead. The focal point was Jesus had paid our sin debit. Then Paul gathered those new believers who had placed their faith in Jesus Christ and started discipleship making groups and called them a church. In Acts 2 we read how the Holy Spirit was poured out on the disciples who prayed. The Spirit that drove Jesus into the wilderness to fast and pray, the same Spirit that compelled the apostle Paul to proclaim the gospel, drove the disciples into the streets of Jerusalem to proclaim the gospel, in over ten dialects and languages. People heard the gospel and followed them to a place where the apostle Peter was ready to deliver an evangelistic message. He then preached a six to ten minute sermonette, say Bible scholars. When Peter concluded his message pointing out that the people listening were sinners and had killed Jesus, the people shouted, “What must we do to be saved!” Peter then instructed them to repent and believe in Jesus Christ. According to Bible scholars, the disciples baptized 3,000 men. Now during this time, women and children were not counted, just the men. So scholars and serious students of God’s Word estimate that the number of baptisms could have been 6,000, 9,000 or more. Now, did you catch the New Testament model for seeing baptisms by the Church? The disciples prayed. They are filled with the Spirit of God. The Spirit drove them into streets, the community of Jerusalem to make Jesus known to everyone who will listen. They gathered their listeners, and Peter proclaims the gospel message again. He does this in six to ten minutes. Then the Preacher gives an evangelistic invitation and people are saved, and baptized. This the biblical model, prayer, community evangelism, evangelistic preaching and invitation, baptism and Bible study groups, and fellowship. So, if we want to follow in the biblical model, your church planting must follow or include the steps given to us by God in Acts chapter two. Then you will see more people come to faith in Jesus and follow Him in believer’s baptism. Since June of 2014, I have been in contact with some 500 plus churches. I have been resourcing the local church from various Christian denominations with evangelism resources produced by an Evangelistic Association known around the world. These resources include prayer cards, to list the names of lost friends and family, evangelistic videos that offer an evangelistic appeal, and a Bible study book for new believers. I have personally met with pastors, spoke with pastors on the phone, and emailed pastors. I have also been in touch with para churches leaders, and church leaders. The results and facts have given me insight to the attitude some pastors and Christians hold about evangelizing lost people today. Of the 500 plus churches, they have automatically categorized themselves into three groups. About one-fourth, of the churches or 125 originally indicated they would participate in an evangelistic emphasis within six to eight months. Another, almost half of the churches decided they would not participate in the nationally driven evangelistic emphasis, even though the resources were provided as free materials by the world-wide acclaimed Evangelistic Association. And another fourth, just never returned my calls, emails or other communications. Of the churches that had verbally committed and others by filling out a registration card, ninety-four followed up with ordering the free resources, prayer cards, DVD and follow-up books. Another third did not order the resources. Of the churches that ordered resources, one-third or thirty of the churches have planned and followed through with an event. Another one-third are still trying to determine a date for their evangelistic event. And the last third has not made a commitment to plan an event at all. So what does the research reveal to us about the pastors, and churches? I see that some pastors are very concerned for reaching lost people with the Gospel of Jesus Christ. In another category, I have observed some church members who are concerned for reaching their lost community with the Gospel. Then there is another group that has not decided yet, that Jesus mandate to proclaim the Gospel as a priority. I believe that all pastors really want to do what is of kingdom significance. Some pastors and staff need help, because their daily calendars are full of so many other assignments and responsibilities. Usually, during a phone conversation, personal meeting, or by social media or email, I am asked, “What have you seen has worked with other churches?” This is where I get to share from my findings and facts what has worked and didn’t work. Sometimes an event didn’t work well because the weather just didn’t allow for the plans to develop. In other cases, the church did not take time to properly promote their event in the correct circles of lost people. For example, if you invite friends and family, co-workers, to your event, you will see some fruit. In other cases, the timing was wrong. The impact of your event is affected by attendance due to a holiday break, school break, summer time vacations, and exam week at school. For those churches who did think through the details, timing, location (church or neutral site), audience, the results were fruitful. Then there are those churches who try something one time and they throw in the towel on evangelism. Have they forgotten that Jesus said, He would empower us and guide us and give us the words to say when it comes to evangelism? Jesus has not changed His mind. He has not retracted His Great Commission Mandate. The last time I read the Bible, Jesus command to go and evangelize the world is still in everlasting. Not even Jesus had a full commitment from all those who heard Him or saw Him. Of the thousands who followed Jesus at some point in His earthly ministry, only 500 were present to see Him ascend into Heaven. When you sit down and think about why a church is in plateau or in decline or dying, there is no really reason for a church to be “just surviving”. Well there is one reason, disobedience to the Great Commission is the only excuse for a church dying out. If we say that Jesus is our Lord and Savior, then why are so many “Christians” afraid to make Him known? Why is there even a fear of sharing the Gospel? Jesus gives all we need to be His witnesses! Maybe doubt has crept in. Maybe discouragement has replaced passion. Many of our pastors and churches are in need of fresh wind of God’s Spirit. I pray that if you are in this present condition, may the Lord Jesus fill you and reignite you to once again have a passionate heart to win lost people to Christ. May your ministry see a harvest of lost souls. Last night I received a call from my son, who had just left a pickup basketball game at our church. He is the pastor of the service that has become a contemporary/multi-cultural/international gathering at our church. A young couple who have a heart for reaching people living in apartments have been invited to move into a complex near our church. This couple had planned and promoted a pickup basketball game in our multi-purpose building. About 20 young men and teenagers showed up to play b ’ball. My son was asked by the young leaders if he could come share the gospel to the group. Someone else had to cancel at the last moment, so my son received the blessing and honors. My preacher son, called me and shared that he had presented a simple and pure gospel presentation to a bunch of millennials, who by the way, are not supposed to care or want to hear the gospel according to some experts. Did I mention that the majority of the individuals where from an apartment complex who had invited our church to invest their tenants? I have found in my over ten years of sharing the gospel in hundreds of apartment complexes across our nation that most times you can find a harvest of souls in these multi-housing communities. And you do not need to make the gospel difficult to understand and explain. Just keep K-I-S-S it, Keep It Simple Saint! We need to communicate the gospel at the age level for 10 to 12 year olds. Make your gospel presentation simple so that anyone can understand the gospel and make a simple but heart felt decision to follow Christ. Then rejoice in the decisions that are made by individuals who response to Jesus’ Spirit as He leads them to respond. Working for the Billy Graham Evangelistic Association over the last few months has been such a blessing. I met so many people and have had many conversations with pastors, ministers and individuals who have told me that they were brought to faith in Jesus while either watching a Billy Graham crusade or read a gospel tract. Gospel tracts still work in spite of what many may say. Gospel tracts do not work if you do not give them away, pass them out to lost people in your community. I recently received by email a story of salvation due to the BGEA efforts. The man was raised Muslim in faith and came to Jesus Christ after reading a gospel tract produced by the Billy Graham Evangelistic Association. The man is so full of gratitude because of the life change he experienced in Jesus Christ. I want to share the story with you. I will leave out the name of certain entities and due to the nature of the work and the groups working in his home land. Please honor our brother’s request and do pray for his family and people group to find the One True Living God in Jesus Christ. Hello brother Victor, it was my joy and an honor and privilege to share Christ with you today. I could not believe someone called me from BGEA. I am a former Muslim in love with The Risen Christ! He called me to Himself in May 2009 when I was going through the darkest moments of my life. A bible tract from Billy Graham started the whole fire in my heart and it is still on to this moment. I am originally from Burkina Faso (West Africa) and I am the first believer in a great family of twenty four children. According to the _ _ _ _ _ _ Project I belong to an unreached people group. My people are “the ______-______” in Burkina Faso. Please pray for my people. Thank you so much for reaching out to me today and may God keep watch over you and bless the ministry of BGEA. Brahima shared that an image of man’s separation from God is what got his attention. He realized that he needed to trust in Jesus Christ alone for salvation and to get into heaven, so he did. If you are interested in giving away gospel tracts, go to http://www.billygrahambookstore.org/product.asp?sku=2161_81762P25 to order the Steps to Peace with God gospel tract. If you have not ordered your My Hope 2014 videos Heaven, you can do so by going to https://myhopewithbillygraham.org/programs/ and order a free copy or download a free copy. I hope that you will get involved with this movement of God and not miss out on what God is doing through http://www.MyHopewithBillyGraham.org. Did you ever play the game as a child “Follow the Leader?” In this game you must do or mimic the person who is the leader. You walk were they walk, act like they would and jump, climb and run. Imagines are probably running through you mind as you read this blog. Jesus called and commanded everyone who professes His Name to “Follow” Him. If you desire and picture yourself living as Jesus lived, then you are following Jesus, our Leader. He is our role model, our example how we are to witness to others. We are to do evangelism like Jesus. Focus: To become the Witness God’s desire you to be. Jesus Christ is the Evangel incarnate. He is the fullest expression of a human being as a committed soul winner, sold out to God’s purpose and the message of salvation. Jesus was the supreme evangelist and soul-winner. His message and method constitute the heart of evangelism. No one will ever be a more perfect evangelist than He. So we must follow His way in making disciples who follow Him. His evangelism strategy was flawless. He came to make disciples—followers who would take His message to all people’s, all nations. 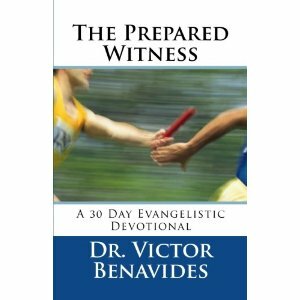 To read more of day seven of “The Prepared Witness” go to amazon.com and order your copy. Also check out our website on http://www.m28evangelism.com.